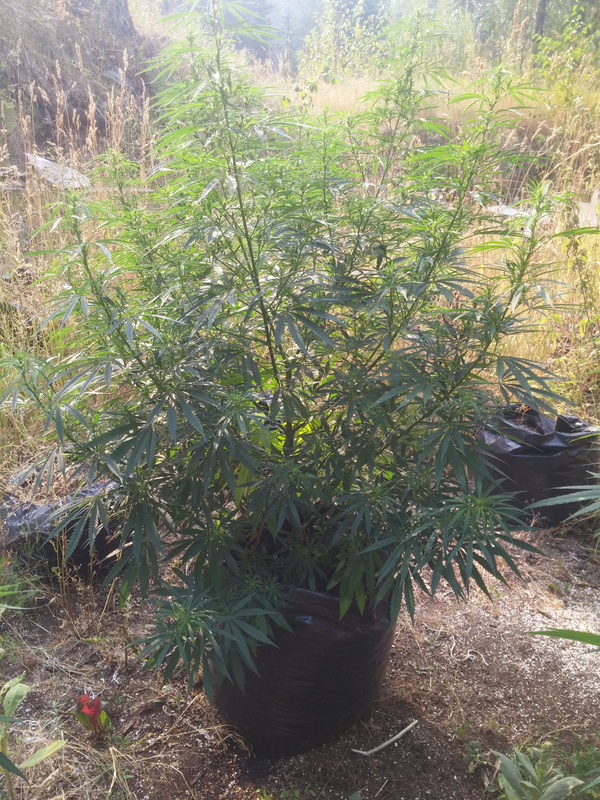 Cannabis Satreeva: A short story about a tall plant -Outdoor , Sativa Dominant Hybrid? Greetings. I bring word of a "new" strain...new to me at least. It's a bit of a long story. 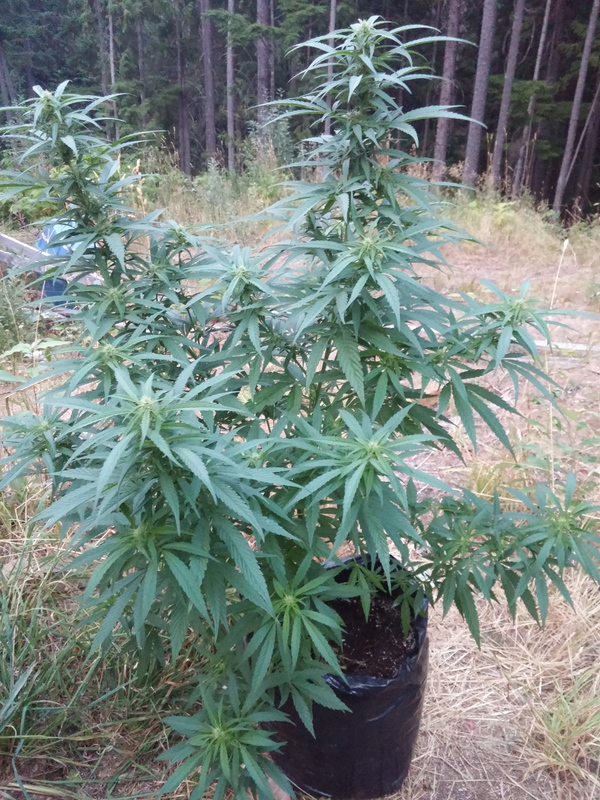 It started with my friend who saved some seed from a batch of very nice indoor buds. There was only say about 10 or so in a half-pound. 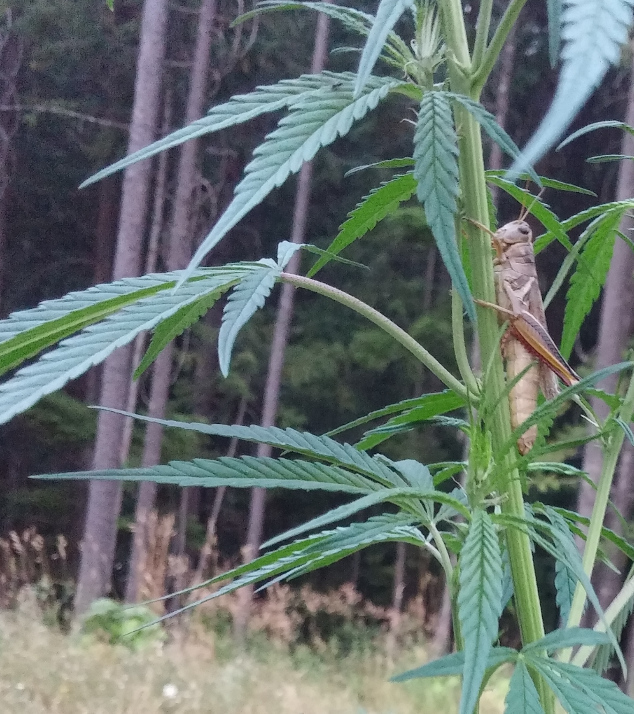 He ended up starting about 20 of them in the spring as an outdoor experiment in Canada. Round about that time he was baby-sitting a puppy and he came into the garage one night to discover 19 busted up beer cups with dead plantlets... and one one single remaining living specimen. He took that and planted it beside his garage. It grew and became evident that it was female. 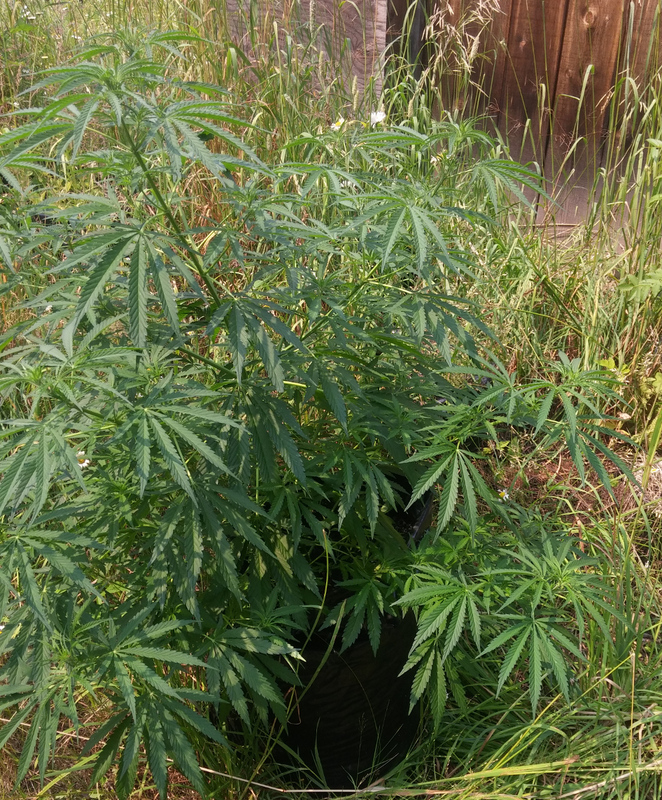 It didn't take long to discover that this plant wants to grow tall quick. It was head height within a month from being put outside in a beer cup. 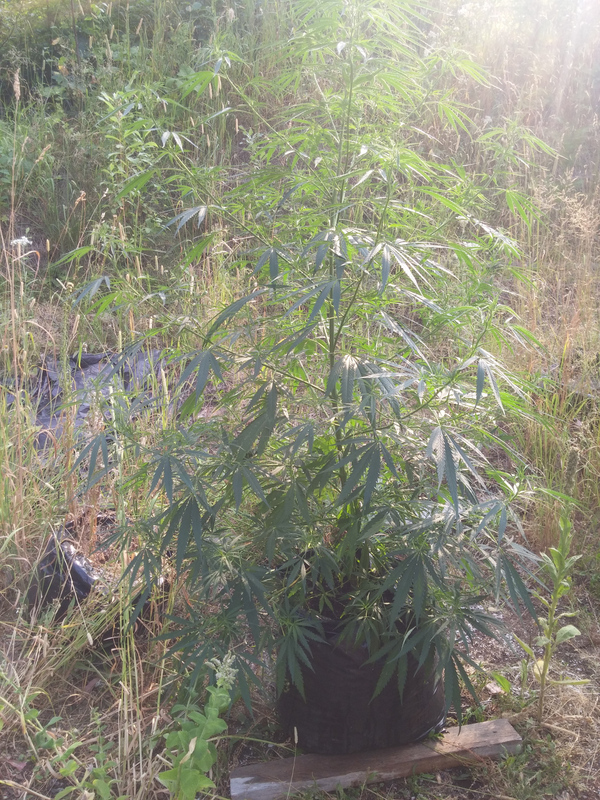 At first the leaves were larger and it grew extremely lanky. 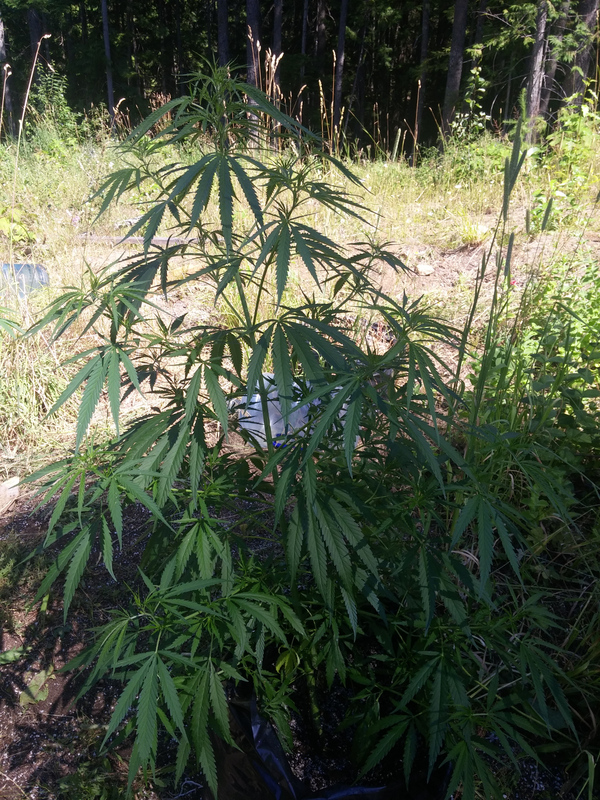 He never pinched it and when I first saw it m it was 12 feet tall in early August. 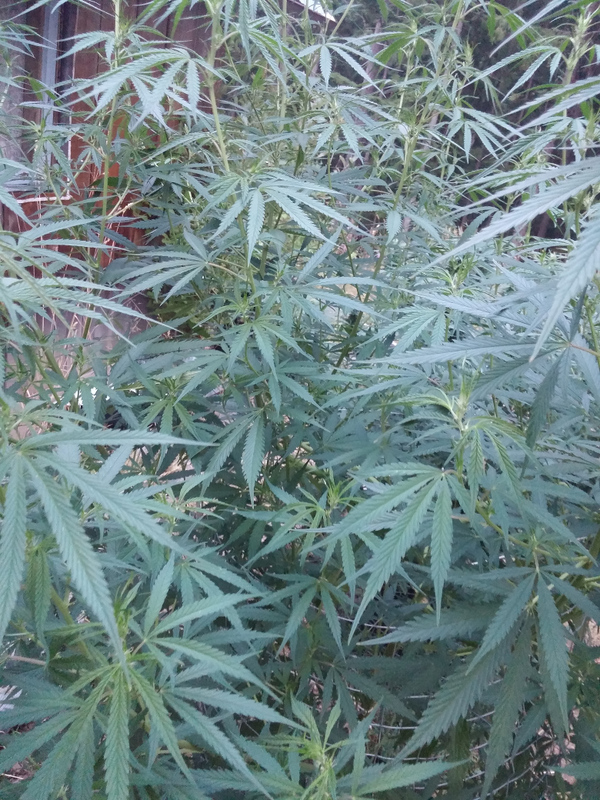 As it started to flower the leaves dropped in size drastically and started looking very Sativa like. The branches have the classic Christmas Tree effect and grow several feet long in each direction at intervals. As the summer turned to fall it flowered more and more , filling in the long skinny arms with buds. It changed colours from pink to vanilla and smelled very exotic of peaches and lime etc. The yield was quite amazing considering he didn't do much of any fertilizing. It was about 1/2 pound or more of buds. 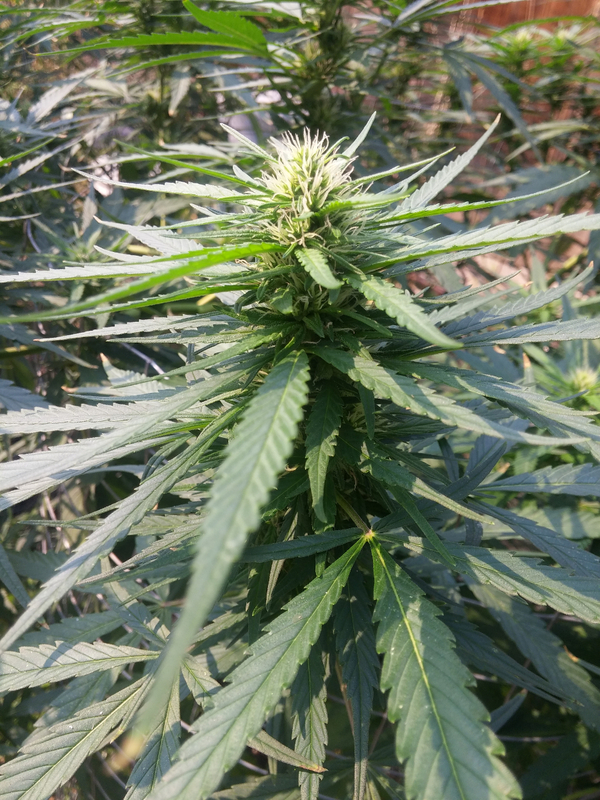 As he harvested the buds he noticed swollen calyxes at the bottom of several buds. There was one small seed in the calyx but no seed in the buds themselves. 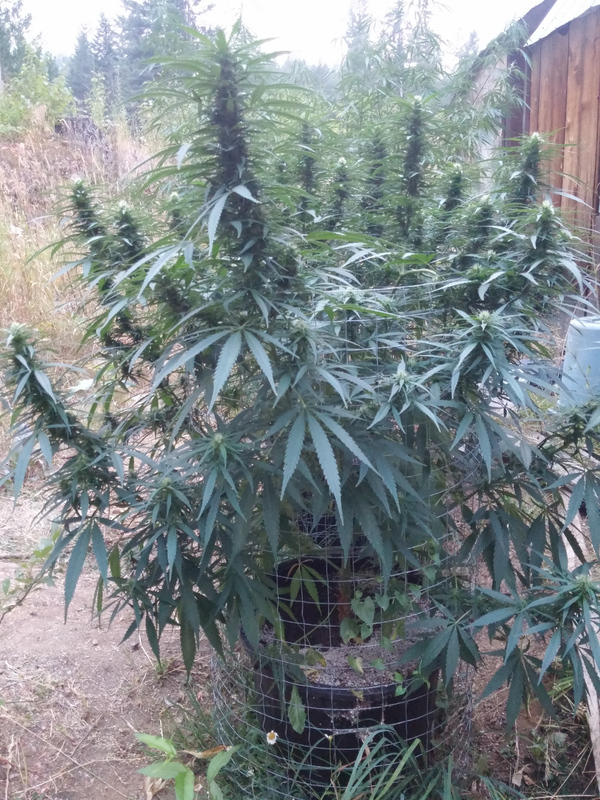 By pure luck this plant was smart enough to know or a tiny bit hermie enough to produce 20 seeds on the entire plant. He bagged everything and kindly gifted me 10 seeds. I grew them out a bit late and they were tiny in beer cups for the first week of June. 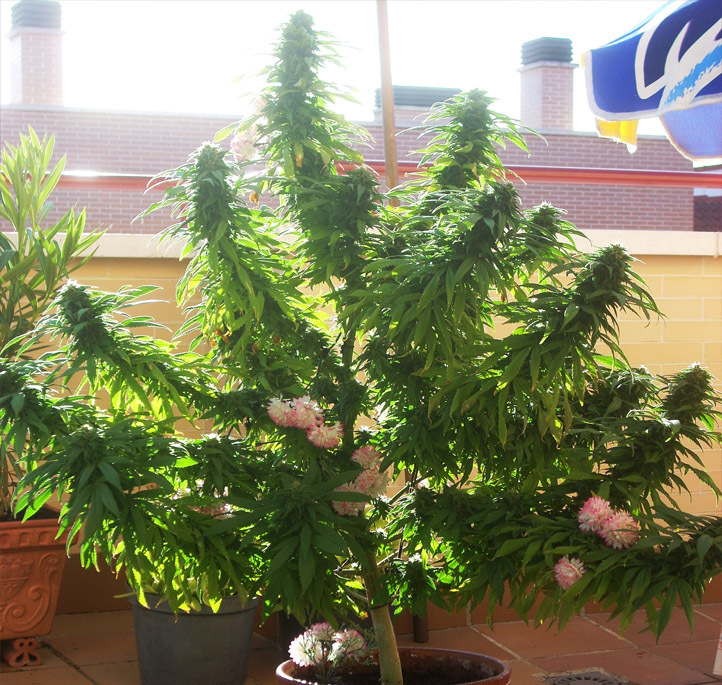 I wasn't sure if they would act like my friends so-called indoor seeds that turned out to be a tree-like Sativa hybrid. Each one upon germinating acted the same which was get tall fast.... 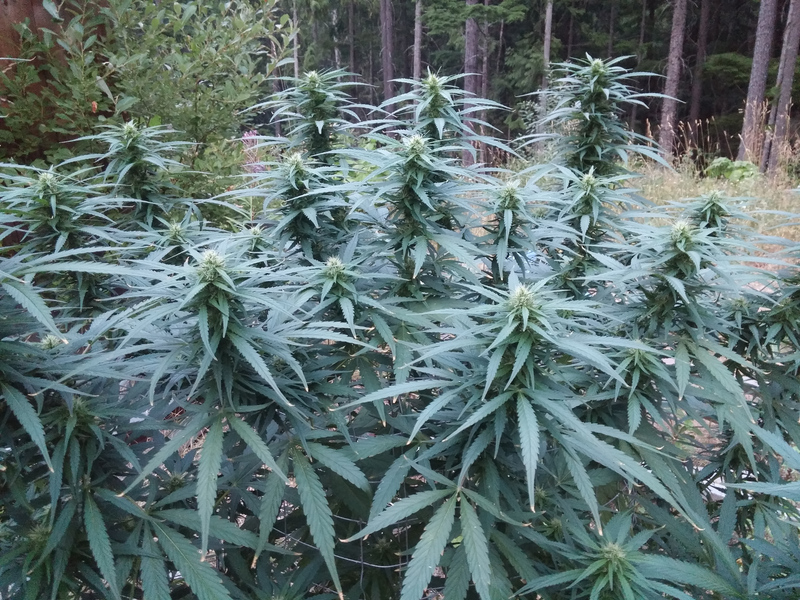 The first leaves were quite large indeed and therefore would seem to eliminate Sativa but they certainly get very Sativa-like in all manners in a hurry. All of the plants sexed within the first month under natural light albeit a heatwave of epic proportions. There was males and females. The males I relocated to another location leaving the ladies in privacy for now. 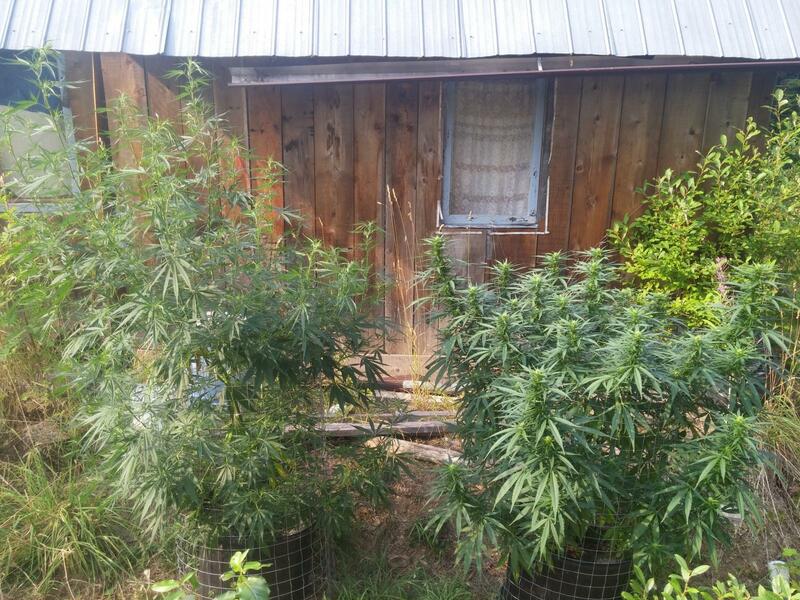 Each female plant from that same mother exhibited different growth traits. All of them had the penchant for getting tall and bushy and had similar leaves. 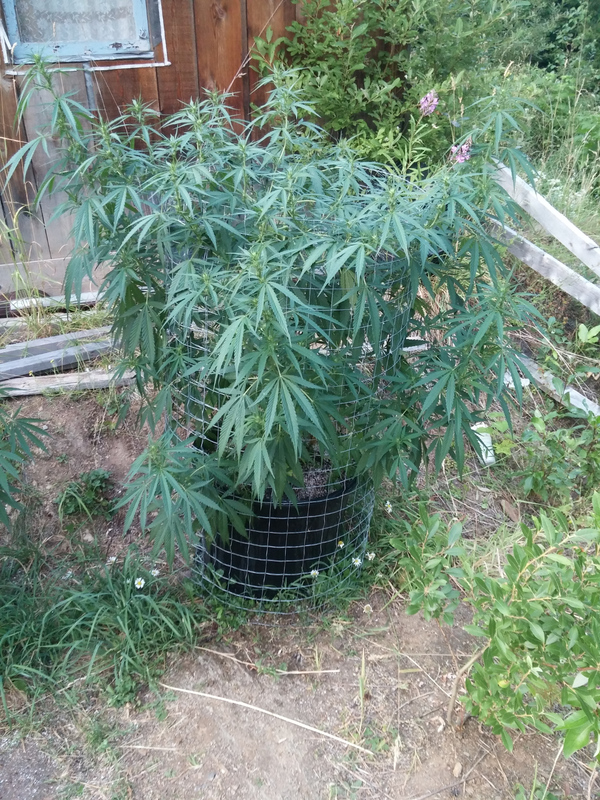 As it grew I pinched it a couple of times and then decided to tether it to a SCROG screen. As the branches grew close to the screen i helped them get pulled through. 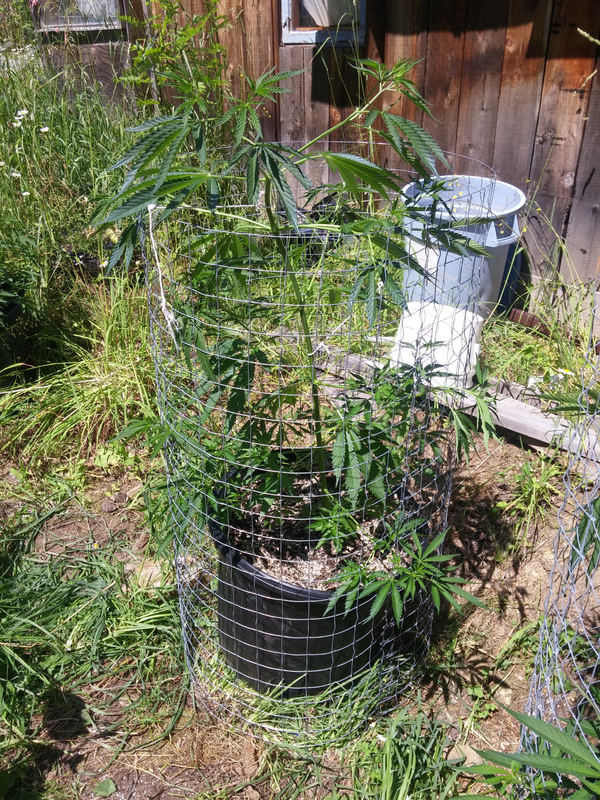 When the top cola grew tall enough I bent it and forced it down and through the caging. This cause rapid branching below. It became obvious early that this was a special plant ! It started budding early and never stopped. Such a lovely transition in a short time ! This is how it looks at the 60 day mark from being set outside in beer cups. August 10th ... from seed ! The second pheo from the original mother seed was very similar to the first except it really really wanted to get tall fast and string-beaned up even though I had pinched it 2 times. Satreeva 2 started getting very tall very quick despite the pinching so I also tethered it to a screen scrog style. 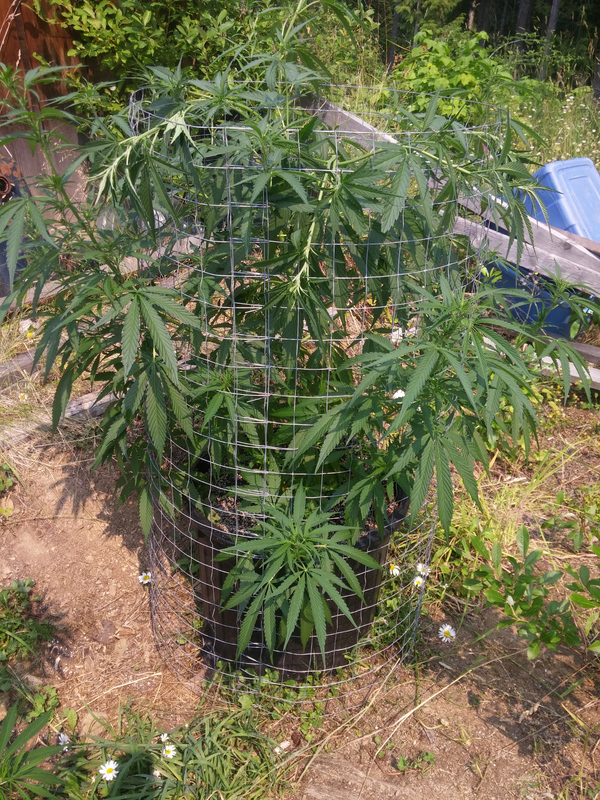 It took patience but I was able to to bend and tie down all the main top colas and force through the lower branches. 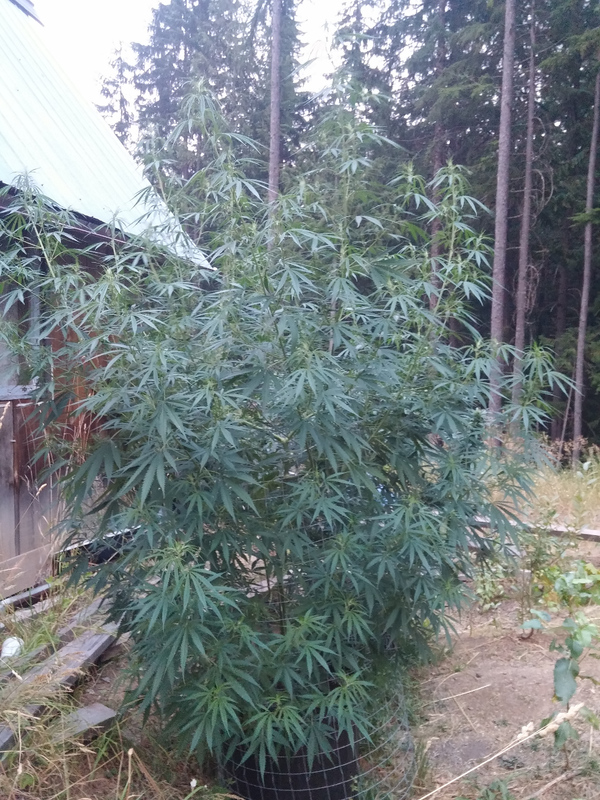 This plant is now 12 feet tall and starting to knot up with buds. It will be later in October when this will be ready. It looks exactly like the original mother Satreeva minus the fact the original was not pinched or tied down.. 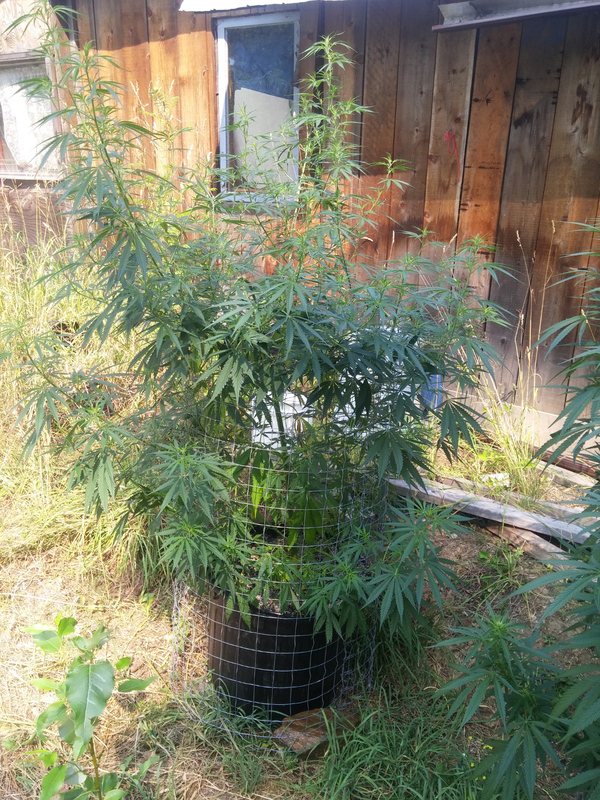 The third pheno started like the others with larger leaves and getting tall quick. I pinched it a few times and decided not to cage it. 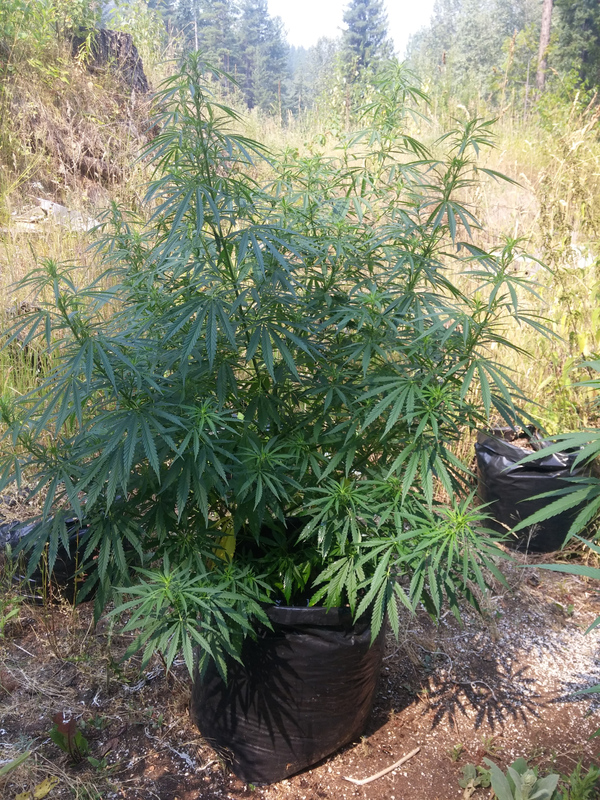 This plant is in a large 15 gallon bag. Leaves started getting thinner and the branches stretched out in all directions. 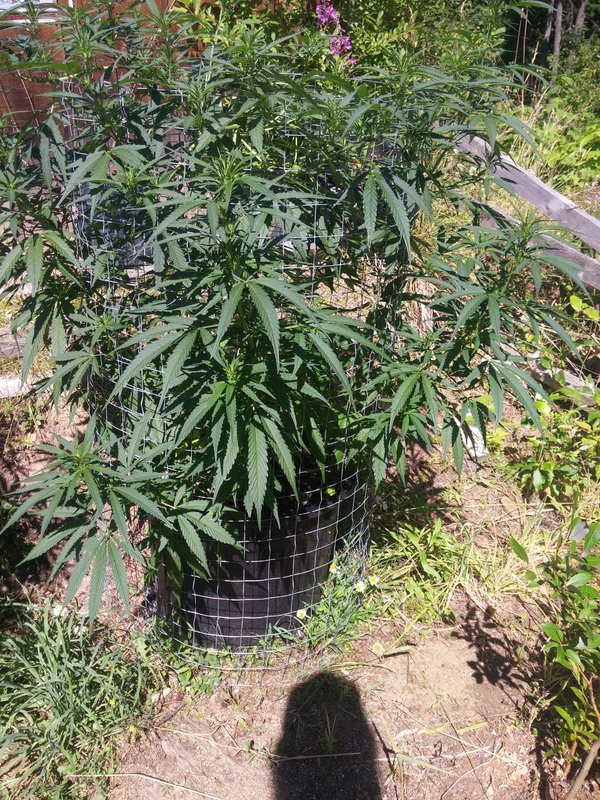 Now its starting to bud and has many long colas. I like the bushyness and long arms of this Satreeva pheno. So just to recap these were all put outside in cups at about 5 inches tall in the first week of June. The rest of the growth took place in the last 60 days. Edited by hyphaenation, 12 August 2017 - 12:50 AM. The photos don't do justice in representing the scale of the plants. 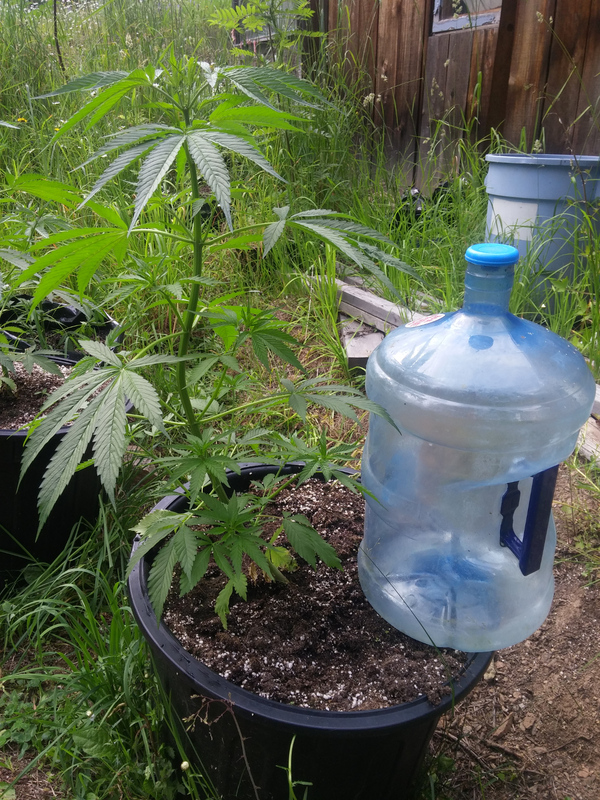 20 gallon pots? That's some leg-room. Taking notes diligently. And silently praying for some excellent seeds. 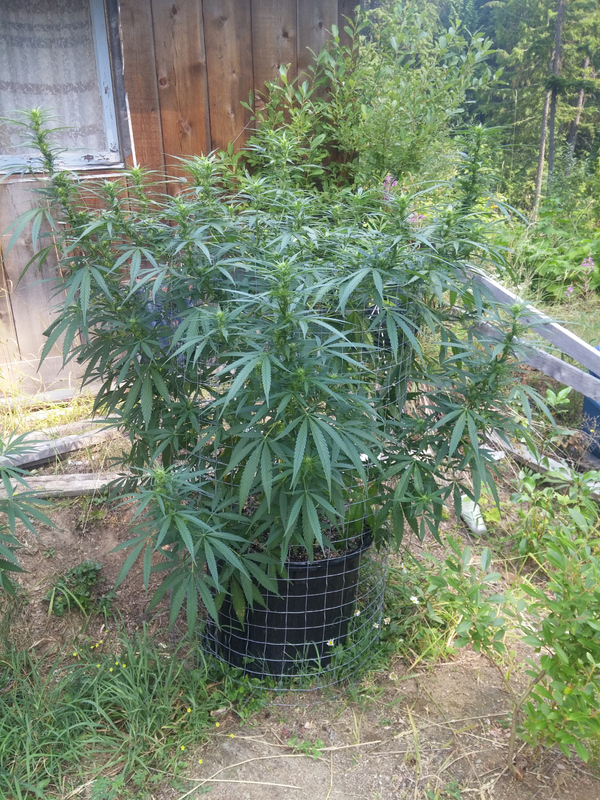 What is your plan for controlled pollination? 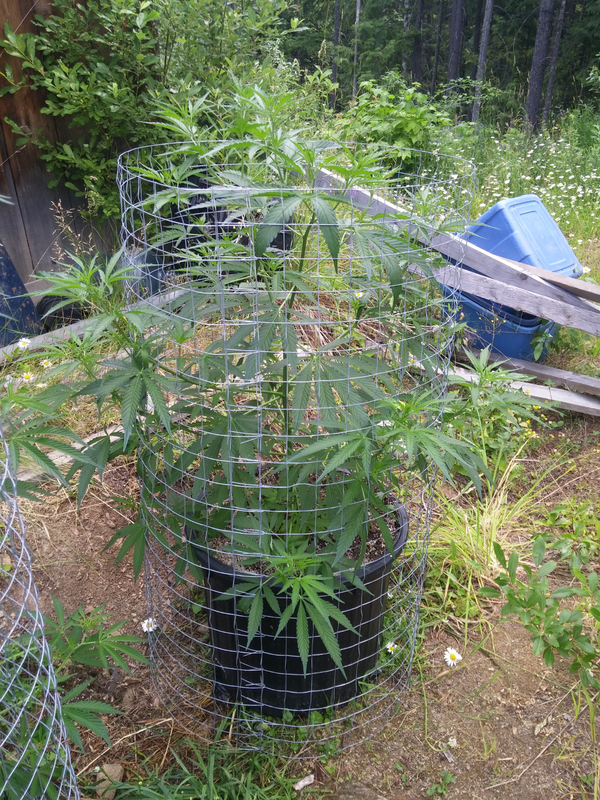 I separated the males to separate locations and let them flower. When they did I collected the pollen and stored it in a ziplock with air sucked out beside a desiccant , marked in a container in the freezer. Then I cut all the tops off and they regrew. The flowers have come back a few times for collecting and later i'm hoping they are back for flowering even if the frozen pollen fails. I have 2 Satreeva large males and a local cross of something that smells of lime. 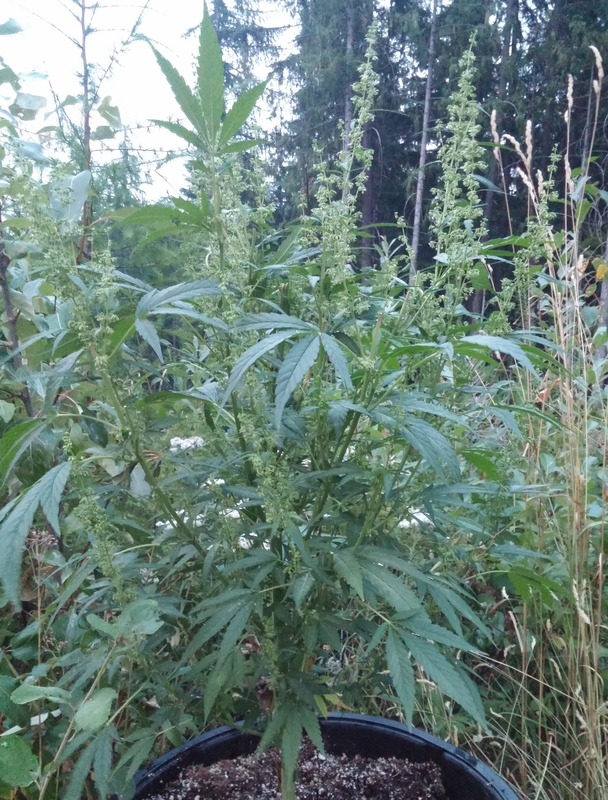 I already tinkled some Satreeva male pollen on the most budded plant and it took to it right away. I tried to do all the lower branches... Later <i hope to cross the later plants with the Satreeva studs also. Since I only have 2 of the same male showing the same traits I'm not to worried about the crossing. I'm not sure if the really earlier budder is partly auto-flower or just extremely early. 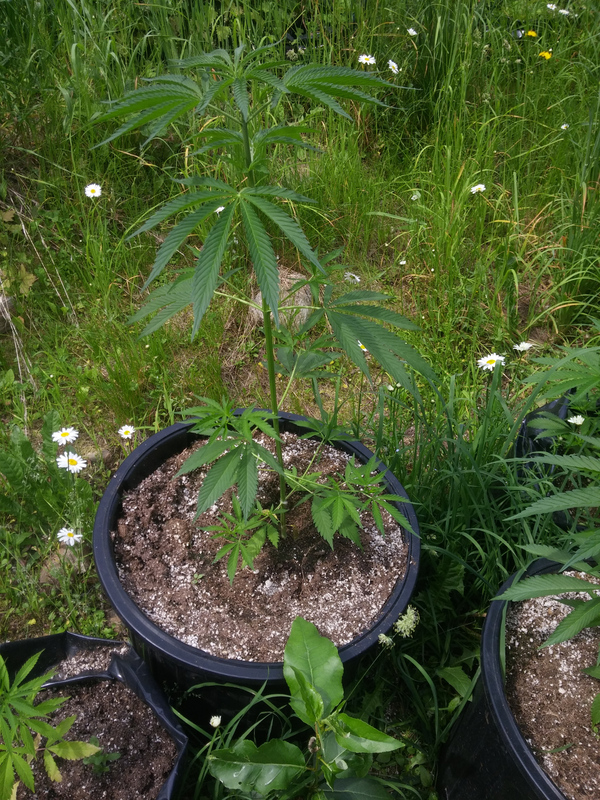 I hope to also keep clones alive over winter and possibly reveg the mother pots. Two Satreeva seeds from the same momma...very different phenos. Very fabulous story . Thank you. Thanks for the explanation on pollenation. I was just wondering. In the past, I've deliberately seeded some indoor stuff. The inside of the bag became dusted with pollen by the flowers. Later in the season I took the bag and gently placed it over a select cola on a female for just a minute or two and them removed it. 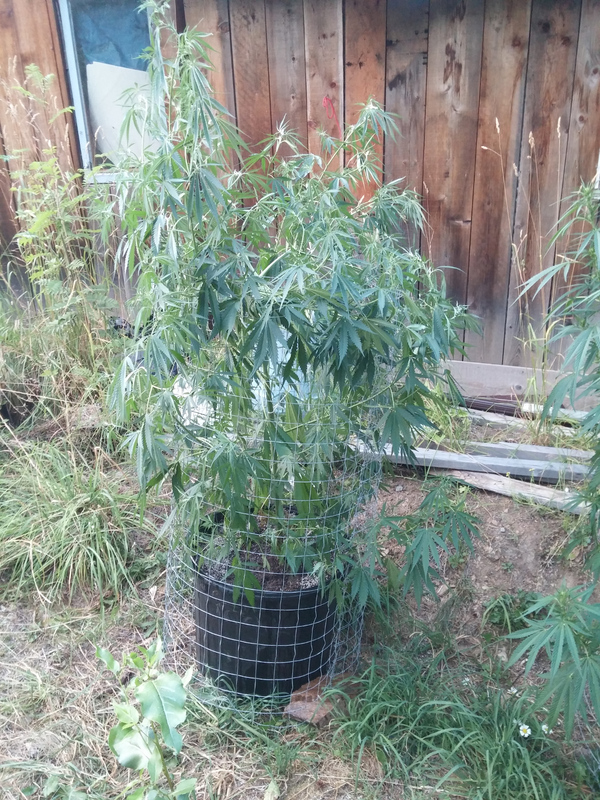 That branch seeded quite well from the brief treatment and none of the other buds (or plants) were "contaminated". Everything else remained seedless. I was just curious as to how you would approach. I really like the looks of your method and would like to replicate if possible. 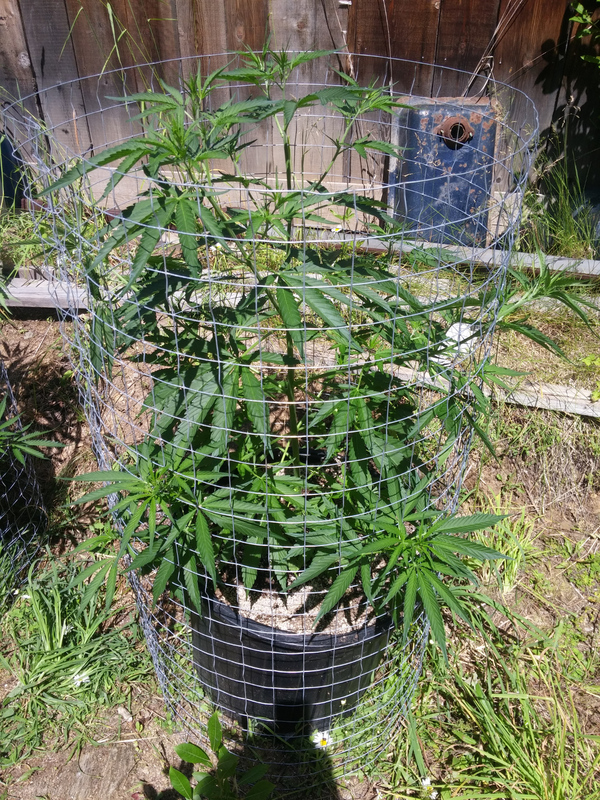 I'm taking notes because I would like to try starting a very good sativa dom next year - but she has to be trained for stealth. Edited by Myc, 12 August 2017 - 02:51 PM. Great looking plants hyph, and an amazing diversity. I will be very much interested in how the bud differs in flavor and effect. I wish I could let a plant go to 12'. 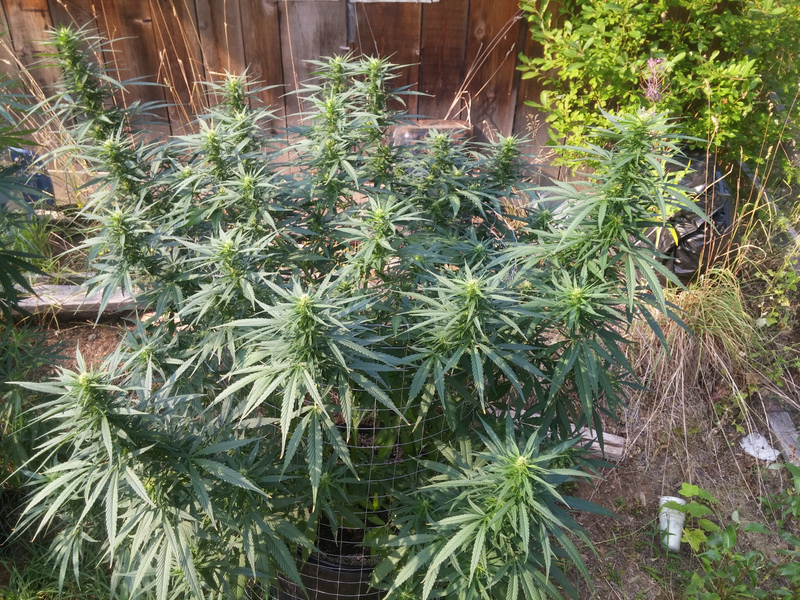 I am fighting to keep my Girl Scout Cookies below fence height at 8' on that side, but yours look amazing when they stretch so high. I appreciate you sharing this great history on these plants. Man Hyph I been looking at your plants last night and again when I came home today and I'm like nothing to say except maybe wow, I'm no expert but if you are curious of possible origin, it sure looks like it may have some Aphgani heritage in there, the big leaf and structure I can't see all in the pictures but even that sativa pheno the budding continues down the branch further than normal and Aphganis go way down the branch anyway of what I had the privilege of seening on a thirty year old strain, thats one reason Skunk #1 is a good yielder but regardless very nice man, very nice. Yah it could be afghani related for sure. Here's another seedling turned female Satreeva. It's the most like it's mom , partly because it was never pinched. The bag is smaller and so the plant is correspondingly. 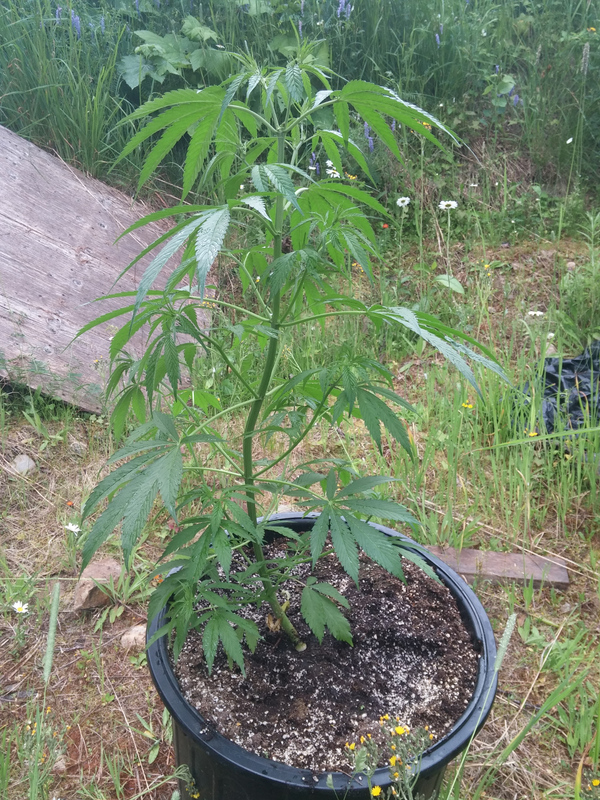 This plant came from the same batch of seeds and I let it take it's natural shape. Firt it got really tall and then started the Christmas Tree Effect. It's just now starting to bud and is probably the least flowering of all of the others. Things could change quite a bit in the next 2 months as the days shorten. Edited by hyphaenation, 12 August 2017 - 09:14 PM. Here's what they all looked like tonight after a long watering and feed. I feed them Botanicare kind bloom 0-6-6 when flowering and Wegners when vegging. I included some pics of the thinning leaves. Satreeva 2 is getting the 0-6-6 Botanicare Kind. I'm keeping it watered well and it's budding up more every day. Satreeva 3 leaves are really changing fast and thinning out as it starts to bud. Satreeva 4 reaching for the sky and starting to but barely budding. Edited by hyphaenation, 13 August 2017 - 12:00 AM. 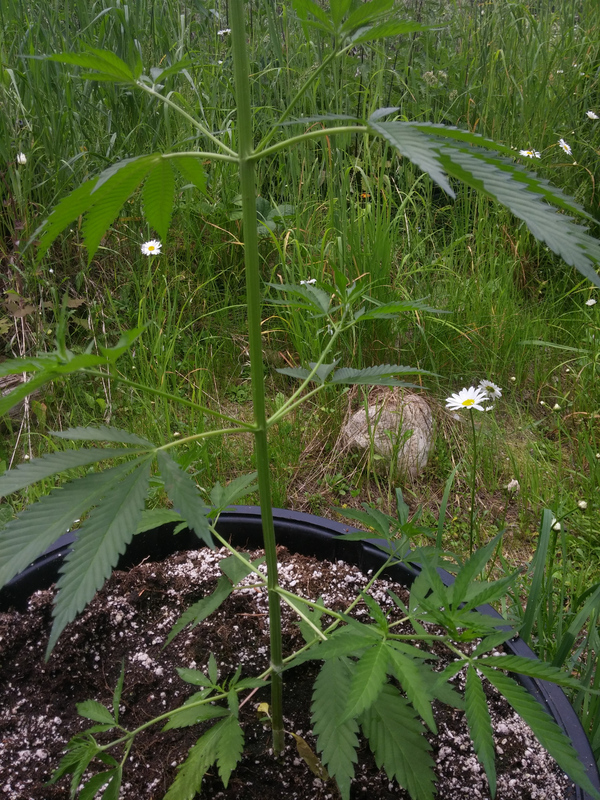 My own cross from the MOBY strain I showed last year/s crossed with a male from a strain called White Grizzly. 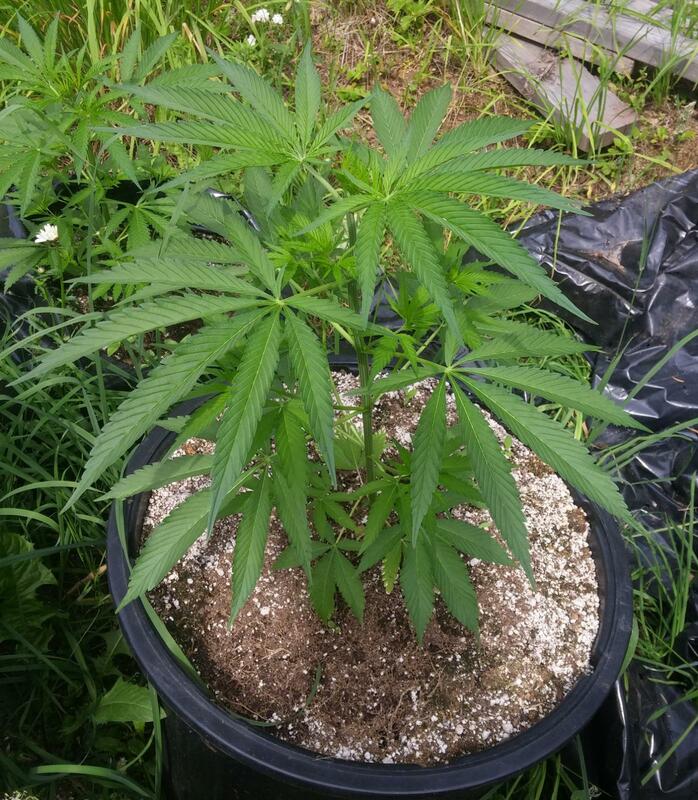 Also started from seed at the beginning of june , budding nicely 60 days later. Smells really limey. Edited by hyphaenation, 13 August 2017 - 12:27 AM. "..cross from the MOBY strain..."
Edited by Hash_Man, 13 August 2017 - 12:05 PM. Hey Hash. 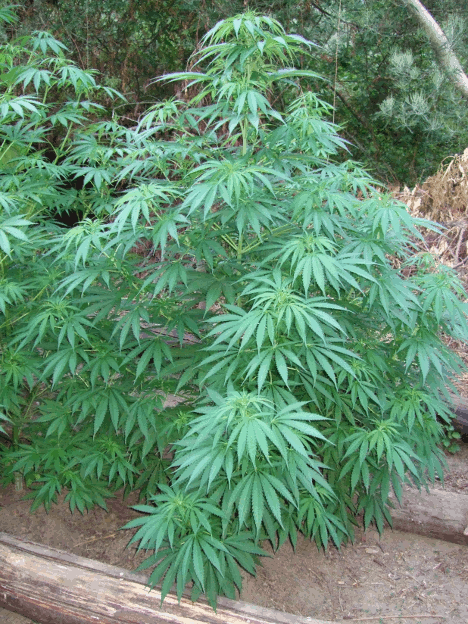 I was reading up about tall afghanis but they say its 100% indica. 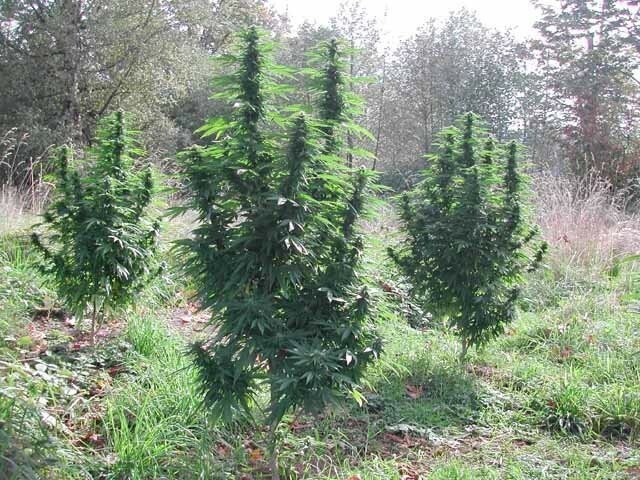 I wonder if theze possible 20 footers (in deep rich soil) could be indica? 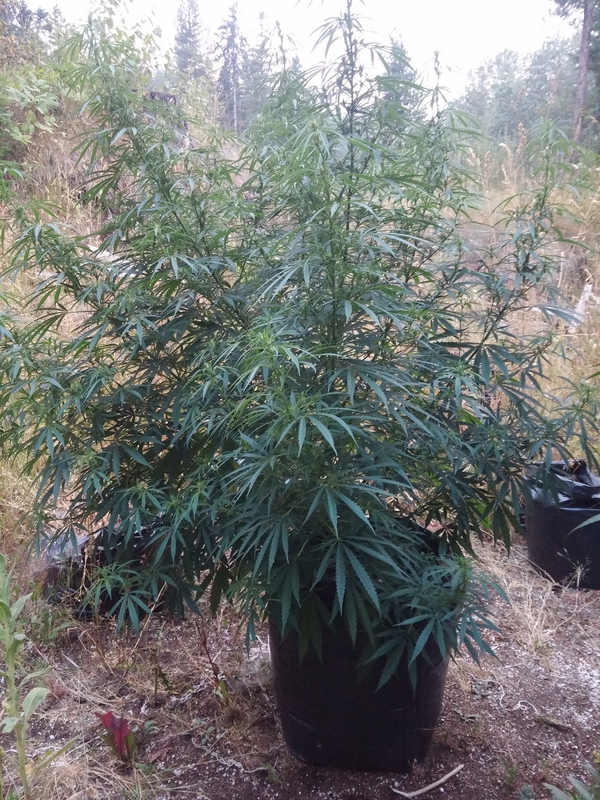 I guess maybe that one landrace breaks the "indica is short fat leafed" rule, if it is afghani. 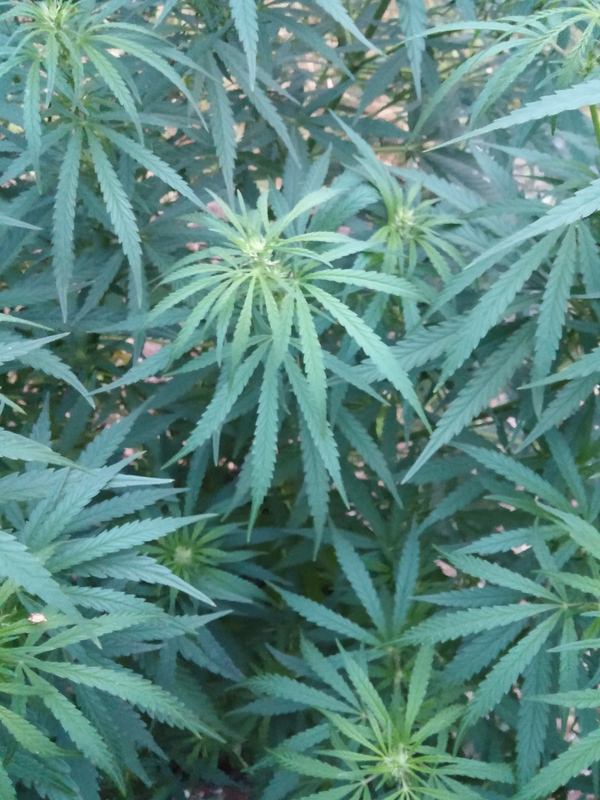 I think a lot of what we think we know about Sativa , Indica etc is proving to be wrong or at least a lot of it is once GC scanned and analyzed. 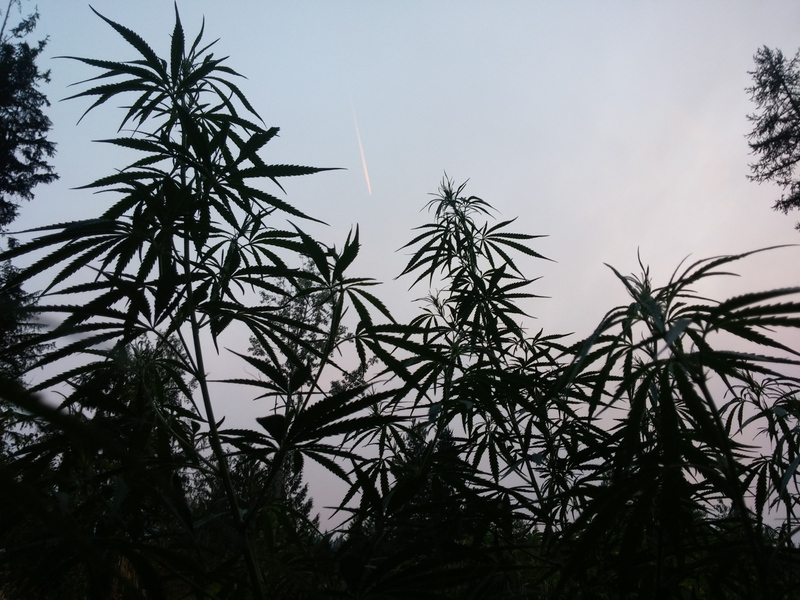 Anyhow Cannabis landrace identification is in flux and turmoil. I have a very awesome book by Connnel-Clarke where he only describes Narrow Leafed varieties NLD and Wide Leaf varieties BLD. That's in chapter 10 ...Its super interesting stuff. Book is 1000 pages ... It gets deep into the phenos and histories. FIGURE 68. 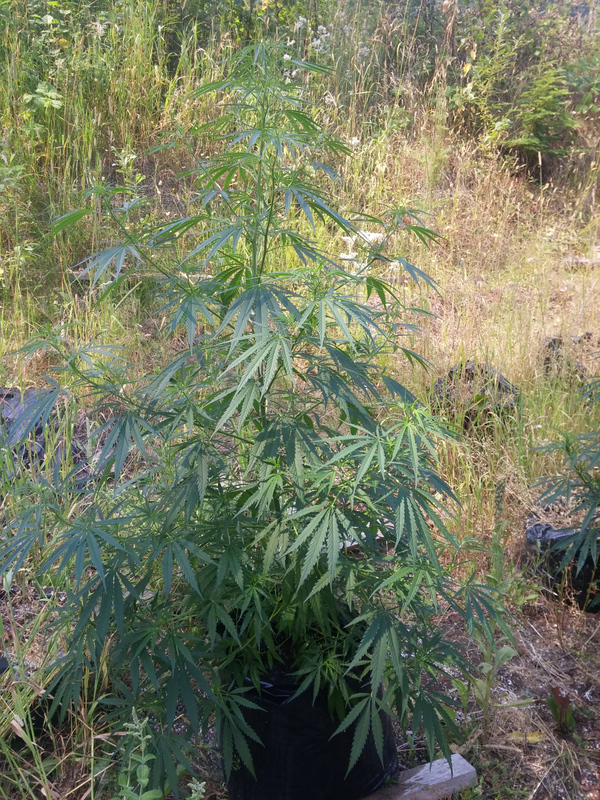 A juvenile narrow-leaf drug (NLD) plant (in the background) is characteristically taller with longer internodes, lax branching, and sparse foliage, while a juvenile broadleaf drug (BLD) plant (in the foreground) is generally shorter with short internodes, more profuse branching, and dense foliage. Edited by hyphaenation, 13 August 2017 - 04:39 PM. I remember seeing a news pic from Afghanistan of some solders walking through a cannabis patch that was many feet taller than they were. ". 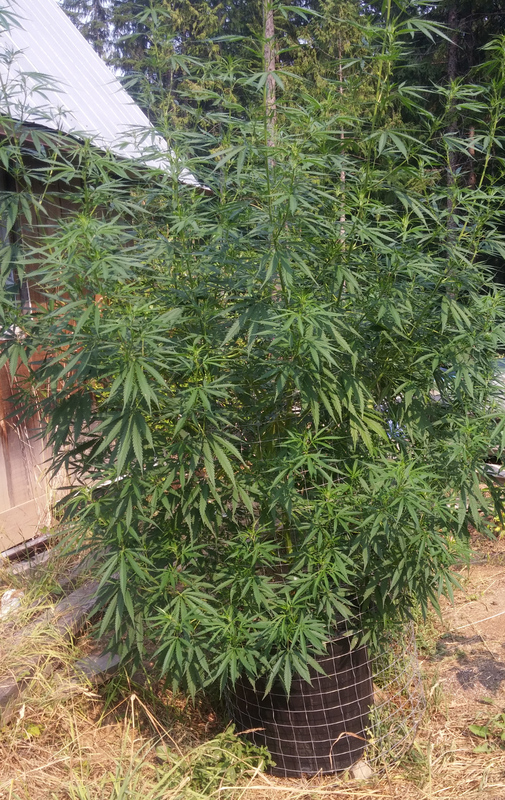 .I was reading up about tall afghanis but they say its 100% indica. ."
Here's the Satreeva male stud that was about 7 feet tall when it started putting out huge flower columns. I cut those back and collected the colas. The colas I stuck into a yogurt container lid with a dozen holes in it. All the arms dangled outward around the lid. I filled the container with water and set it on a sheet of plastic. A few times I flicked the still alive branches causing a pollen cloud to fall on the plastic. I collected that and repeated. The pollen I placed in an air-free bag and then in a container with a desiccant and in the deep-freezer. Then I bucked the male right down to the bottom 2 feet. It has since formed another crown of pollen thick flowers. ". .It became obvious early that this was a special plant ! 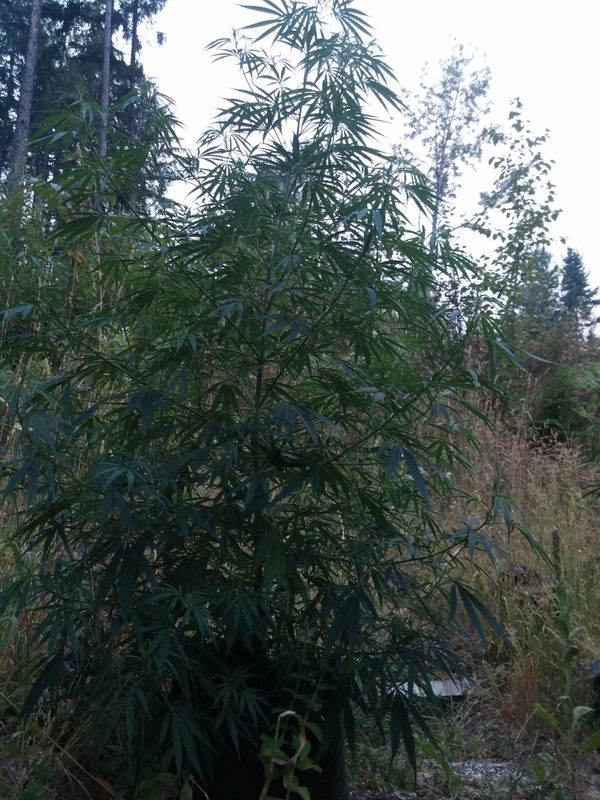 It started budding early and never stopped. ."
I'm going to take clones and/or reveg the mamas over winter. Not sure if the latter is feasible for space. I'm excited to have seeds but i'd really like to have the moms genetics saved for next year.